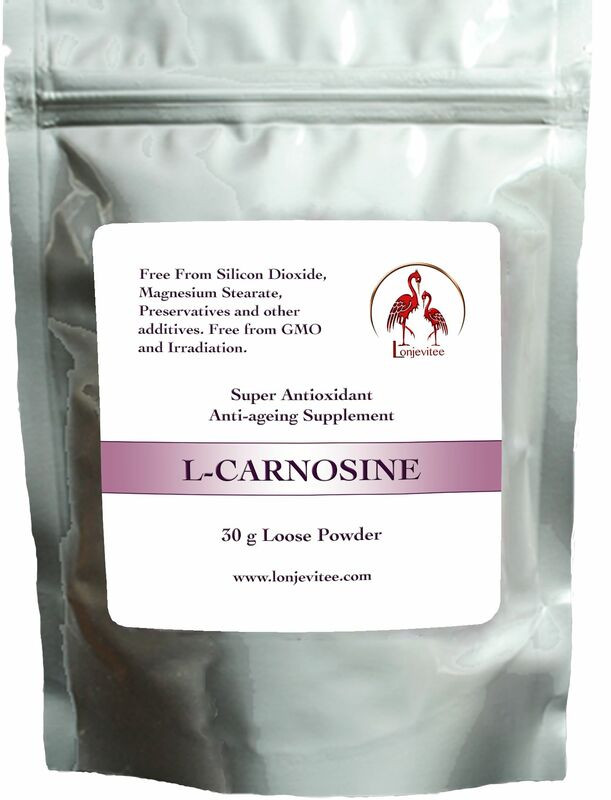 L-Carnosine, 100% Pure Super Antioxidant with no fillers or additives. Ingredients: 100% pure L-Carnosine powder. ...Carnosine is one of the most powerful anti-ageing antioxidants. It is used by the body to protect cells against free radical damage, increase the healing responses and longevity of cells and organs. By taking this supplement you are ensuring that sufficient Carnosine is present to allow full protection from premature ageing caused by oxidation and toxic metal damage. Carnosine is found in meat but in small quantities which are quickly used up by the body. Research has shown that more than 1 gram of pure Carnosine a day is needed to gain from its beneficial effects. Taking several grams through the day provides the most powerful results. At Lonjevitee we are committed to providing you with the best quality that can be found anywhere in the world and at the most realistic prices. Taking one gram a day from a 100 g pouch or tub of Lonjevitee's Carnosine costs only 77p a day. The scoop provided with the container measures approximately half a gram when packed full and then levelled off. Two scoops 5 to 10 times a day for health restoration. We offer generous discounts for anyone wanting to use a large amount daily or for resale. It is best to take this supplement throughout the day rather than all at once in order to get the most benefit. It dissolves easily into a glass of water or a hot drink with no noticeable taste or smell. Carnosine Vegetarian Capsules 100 x 250mg L-Carnosine with no fillers or flow agents.